Surrounded by the high peaks, clear lakes, streams, and rivers, Lake Placid and the Adirondack Park is a wonderful place to enjoy a vacation, and a great meal. Lake Placid area has a wonderful variety of restaurants, pubs, and eateries to suit both your personal taste buds and pocket book. Great food is part of the vacation experience, and this area will not disappoint you in it's abundance of choices: fine dining on an outdoor deck over looking a lake, finger licking wings at a local brew pub, roadside Inns with homemade pies, pancakes served with real New York Maple syrup, the menu is endless. Getting hungry? Take a look at some of these great places to eat! 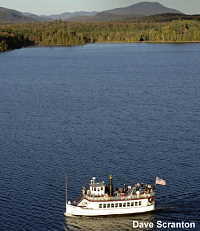 Dining in Lake Placid or Raquette Lake. 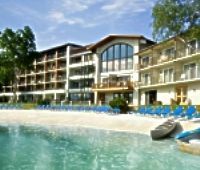 Beautiful in a winter or summer setting, the Golden Arrow Lakeside Resort on Mirror Lake provides an exciting setting for outdoor pleasures, offering the best location in Lake Placid. Snuggled under furs on dogsleds or basking in the sun, surrender yourself to the majestic beauty of the Adirondacks. 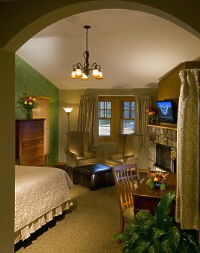 This Earth Friendly, smoke free resort offers all the comforts of home. Beautifully designed, smoke-free guest rooms open to majestic views of the High Peaks. Suites, condos, kitchenettes and fireplace/Jacuzzi rooms are also available. For your aquatic pleasures, try our heated indoor pool or relax on our private white sand beach and swim in the cool clear waters of Mirror Lake. Enjoy free canoes and boats for exploring the shore line. Lake trout, bass and perch abound for the fisherman. Enjoy a breathtaking setting at the Golden Arrow Lakeside Resort.